The 2013 High Speed Rail in Australia Study Phase 2 Report (large pdf file) was delivered in 2012 as a preliminary study towards constructing High-Speed Inter-Capital Rail along the Australia's eastern seabord. "about $114 billion (in 2012 terms), comprising $64 billion between Brisbane and Sydney and $50 billion between Sydney, Canberra and Melbourne." "By 2065, HSR could attract 40 per cent of inter- city air travel on the east coast and 60 per cent of regional air travel (primarily long regional). On the three main sectors, Sydney-Melbourne, Sydney-Brisbane and Sydney-Canberra, HSR could attract more than 50 per cent of the air travel market." The current flight time from Sydney to Melbourne is 1 hour and 35 minutes. So allowing for the extra transfer time required with air ravel, where one generally arrives an hour before one's flight after traveling half an hour or so on a freeway, HSR would APPEAR to be relatively time competitive to its alternative mode. But consider this - Sydney's current airport rail link carries just 17% of traffic to the airport. The alternative mode via taxi or private vehicle is both cost and time UNCOMPETITIVE with rail transit. Travelers know they'll still need to factor in getting to their hotel or wherever once at their ultimate destination and lugging their bags via some means to the train station. Somehow rail always seems sexier as an idea than as a reality to people. The Phase Two Report numbers seem intuitively optimistic to me. I just can't see business travelers, who make up the majority of this route shifting to train travel, where the company gets their cab fare at either end anyway seeing the imperative to travel by rail. However they are backed up by international research into mode-share for HSR versus air over similar distances and volumes. But the Phase Two Report makes it explicit; "A key (benefit) component is the assessment of time savings for travellers across their full journey including travel time, waiting time, check-in time and access time, with adjustments for the inconvenience of having to change modes." The gains here all accrue to the private sector, but require a huge public subsidy to facilitate them. That should be an enormous warning sign to any elected official that their project is about transferring value FROM the public purse. And that private benefit will accrue on, again by the report's own numbers, just 18,760 Melbourne-Sydney trips a year. For a $50bn pricetag. Over a decade, that's a 0.26 million dollar public subsidy PER TRIP. This is just ludicrous public economics. Let's be clear - our biggest policy problem in Australia worthy of $50bn of public funds is NOT the higher emissions caused by people traveling from Melbourne to Sydney by air. Nor is it the amount of time these people spend getting to or from the airport a handful of times a year on average. Air transport emissions are an issue of certain public concern obviously, but in the greater pantheon of public spending demands, it isn't remotely on the radar. But the straining of our eastern capital cities IS. Enabling regional commuter centers and allowing us to end the process of urban sprawl that leaves the city's most needy consigned to urban ghettoes with poor social services and networks IS, at least for this commentator somewhere close to the top of our list of needs. And so it gets worse. Again the Phase Two Report states "To achieve the target journey time of under three hours for Sydney-Melbourne, an average journey speed of approximately 300 kilometres per hour would need to be achieved. This would require a system capable of a maximum operating speed of 350 kilometres per hour, to allow for some slower sections of track." But the study also clearly articulates that these speeds won't be possible if the network is also used for commuter travel into suburban centres. IE this whole things assumes the trains are EXPRESS Melbourne to Sydney which COMPLETELY DENUDES HSR OF ONE OF ITS KEY BENEFITS - FACILITATING THE GROWTH OF SATELLITE COMMUTER TOWNS. If the speed of the network is reduced to 250km/h then the Sydney-Melbourne journey time balloons to three hours and seventeen minutes - and over four hours at 200 kph. So, we can't have a network that does both - intercapital and commuter HSR. And because I see all the REAL PUBLIC benefits from HSR as accruing from a commuter network, I believe every sane advocate of HSR in this country needs to be clamouring for an immediate re-assessment of the project's priorities to create a COMMUTER network as first priority, one that could be expanded into an inter-capital network at a later date. Towards that end, this week we're looking at what an effective HSR network enabling commuter travel into MELBOURNE might look like, and what benefits would accrue to the state of Victoria from such a network. To best enable commuter HSR to maximise the number of commuter journeys possible into Melbourne from effective satellite regional centres. This proposal is costed on the basis of the Phase 2 Study estimate of construction costs of $56m per kilometer on its proposed Shepparton-Melbourne section. This incorporates a higher cost of getting HSR in to Melbourne, but under my model if we use the existing RRL tracks/reservation the cost per kilometre may be signifcantly lower. It should also be noted that the Phase 2 Study costed track graded to run trains capable of 350 km/h. My figures only anticipate running commuter services at the lower speeds of 250 km/h, requiring track capable of max 300 km/h. So, my actual figures should be either be CHEAPER than those shown if a lower capacity track were used, or my time savings HIGHER than those indicated if we had higher capacity track. The total construction cost of the proposal at face value is $17.03 bn. Allowing for some featherbedding, we can comfortably state the project could be delivered for under $20 bn. Instead of spending $50bn on Melbourne-Sydney HSR, Canberra should jointly fund this $20bn project with the State of Victoria. It would therefore represent a $10bn investment towards the long-run development of Melbourne-Sydney HSR. 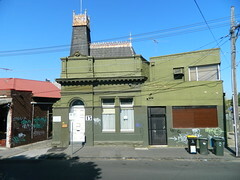 Victoria would then need to find $10bn, which could easily be done with a combination of value capture methods, debt, or even a one-off "Melbourne congestion levee" implemented probably best via a Melbourne Water surcharge on everyone in Melbourne, Ballarat and Bendigo who all stand to gain from the proposal. In line with the above objectives, our best potential established regional commuter centres - by distance to Melbourne - are Ballarat, Geelong and Bendigo. 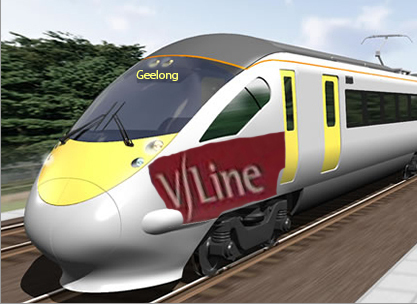 At present PTV's plans for Geelong involve a long-run electrification of the route, without any clear timeline. No upgrades are planned for the Ballarat or Bendigo routes. I propose instead, because all these services now run on dedicated Regional Rail Link tracks through suburban Melbourne, that the Ballarat and Geelong routes be completely replaced by HSR in to Southern Cross Station. Instead of replacing the Bendigo line, which currently runs direct from Castlemaine-Melbourne and only uses Regional Rail Link from Nth Melbourne Station to Southern Cross, it is proposed to create a new HSR Bendigo-Ballarat route replacing the existing track section Bendigo through Castlemaine and with a new dedicated HSR track running via one of two routes to Ballarat, depending on whether Daylesford is included in the network. Under this proposal, I envisage V/Line services continuing with existing V/Locity rolling stock on the existing Bendigo line as far as Malmsbury - that being the northernmost station that wouldn't receive HSR, although it may only be economic to continue it as far north as Kyneton. Under this proposal, this line would to return to sharing the network with Metro trains between North Melbourne and Southern Cross, though this would be a relatively minor issue. A bigger issue would be how to have Metro trains service the planned future Melton line electrification if the RRL tracks were ripped up for HSR. One I'll set aside because it's kind of boring, but it's one that would need to be solved for Tarneit and Wyndham Vale Stations also. 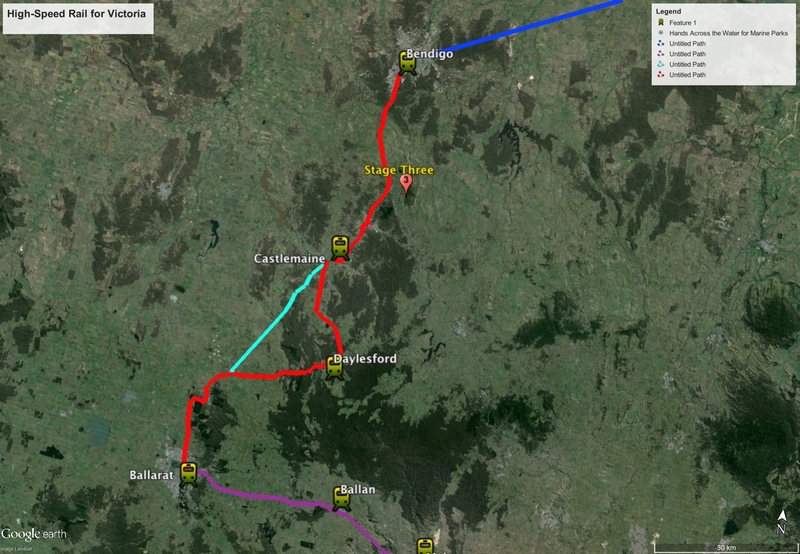 The only major question posed by route selection is whether the increase in travel time to and from Castlemaine and Bendigo that would result from including a Daylesford stop on the route would be justified. At the estimated increase in time of just nine minutes, this would seem justified based on the potential to Victoria's tourism industry of being able to take a one hour train trip to Daylesford. 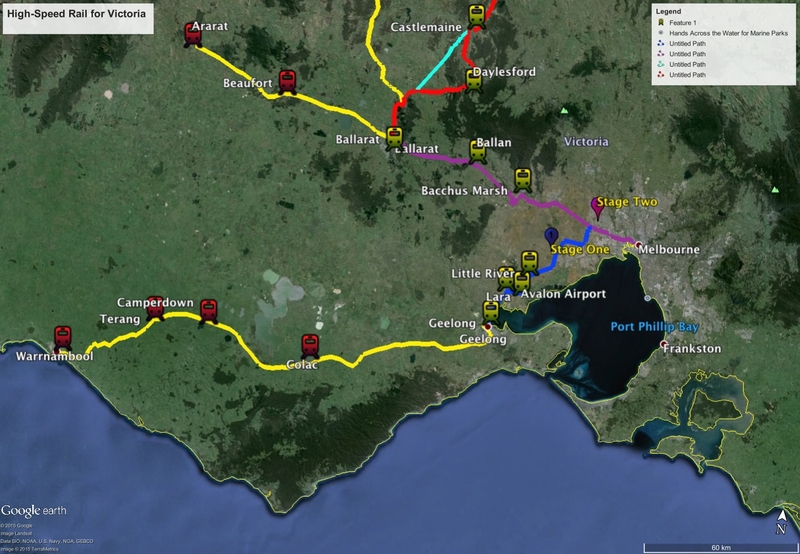 As stated, both the Ballarat and Geelong lines would be replaced in their entirety using current alignments and easements, with the sole exception being the dog-leg placed in the Melbourne-Geelong route to allow for the inclusion of Avalon Airport. 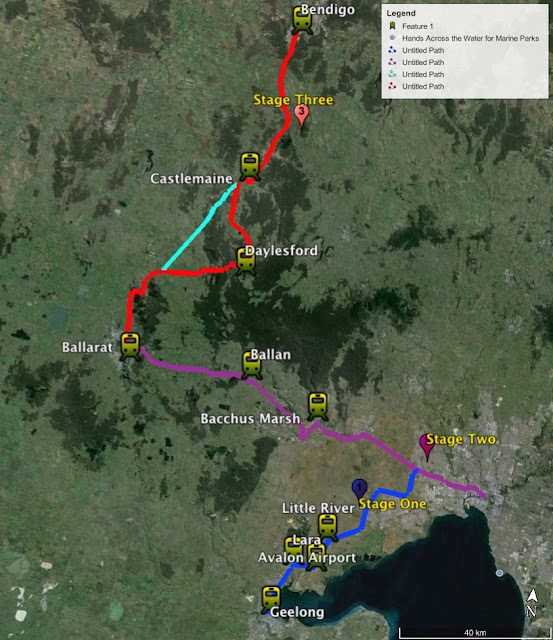 Provision of heavy rail to Avalon remains a major public policy concern in Victoria, and the deviation would add a matter of around three minutes to the journey, so this is a negative-brainer. Another issue will be the need for planning and provision of metro-style public transport infrastructure in regional centers. In fact the current Victorian government has commenced tentative planning towards this end in some centers. 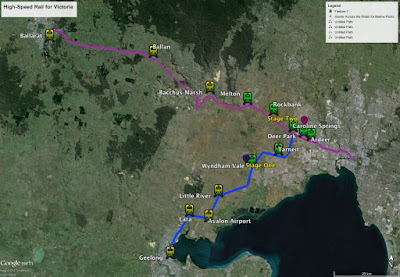 It would need to be coordinated and consider how metro services in Geelong in particular would interact with the HSR, where HSR tracks in Geelong would replace notionally "metro" ones in the north of the city. A large part of the featherbedding in my costing is to allow for necessary track duplication works (possible with double-decking) into urban areas. Please note these times are based on existing train travel times, although for our purposes a better comparison might be with current motor vehicle transit times, these are almost impossible to extrapolate meaningfully into the future. 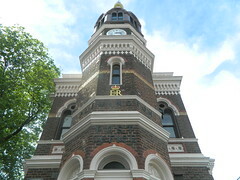 Because Stage Three of the project envisages Bendigo trains running express from Ballarat to Melbourne, passengers will at that point be offered an even speedier express service to Melbourne. It is envisaged that as per present services, demand to Melton and Rockbank would not initially warrant all services stopping there. Accordingly, Ballarat-Melbourne travelers would have a choice of "two stop" or "four stop" services, and ultimately also an express service. 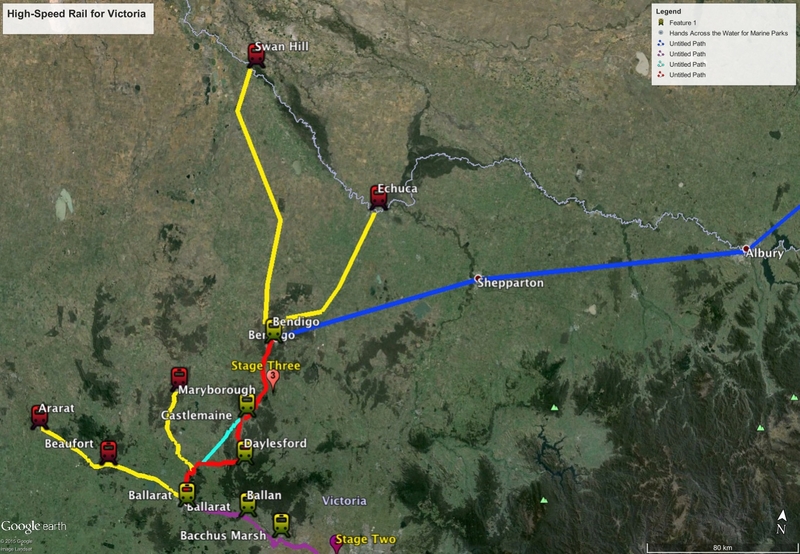 Ballarat - Melbourne with four stops via HSR travel time 48 minutes down from 72. Save 24 minutes. Ballarat - Melbourne with two stops via HSR travel time 42 minutes. Save 30 minutes. Ballarat - Melbourne HSR Express travel time 36 minutes. Save 36 minutes. Travel time HALVED. Please note also that these time savings are predicated on speeds of ONLY 200 km/h. The likelihood of being able to build a network attaining speeds of up to 250 km/h without much incremental expense is extremely high. So these estimates are at the PESSIMISTIC end of the spectrum. The reality SHOULD be even better. As per Stage One, not all these stations demand being serviced by every train. It is envisaged travelers from Geelong would have the option of an "Express" service to Melbourne stopping only at Avalon Airport, in addition to the slightly longer services. Geelong - Melbourne with one stop travel time 27 minutes, down from 62. Save 35 minutes. Travel Time more than HALVED. Greater Ballarat, Greater Geelong, Greater Bendigo, Lara, Little River, Ballan, Bacchus Marsh and Castlemaine. NB I wouldn't propose significant residential development for Daylesford, where preserving and enhancing Tourism and Heritage values should be the objective. 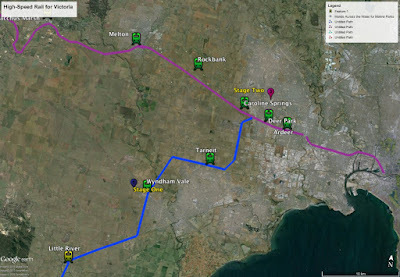 Looking beyond this though, while it will be these designated commuter cities that stand to benefit most economically and socially from fast rail access to Melbourne, travel times will be reduced significantly to a vast range of regional towns that would it is envisaged retain their existing V/Line service as a shuttle to the nearest major center. 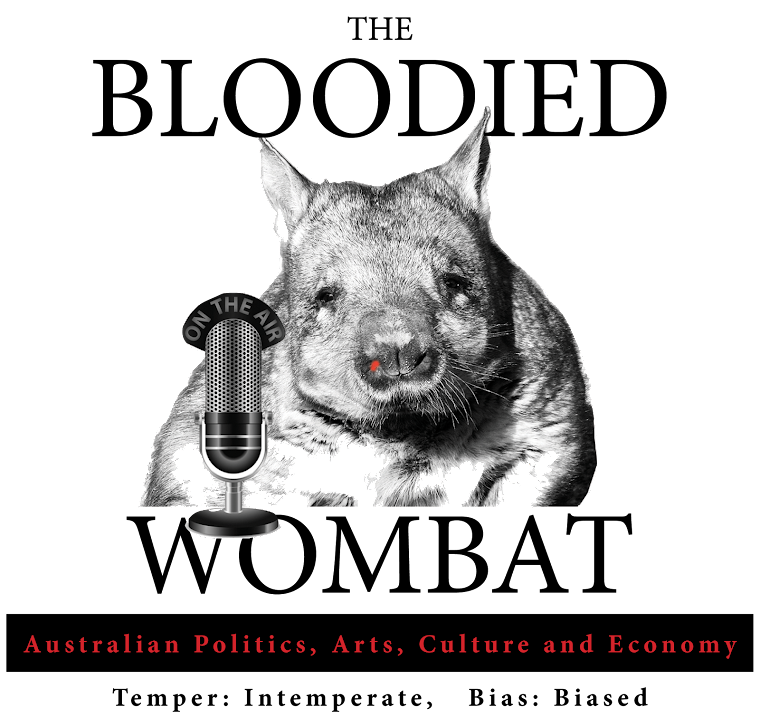 So, we should actually see benefits accrue to Swan Hill and Echuca, Ararat, Maryborough, all of which would still be a relatively short hop to being on the High Speed Network, and even further flung places on the network like Colac and Warrnambool should benefit proportionately also. Ripping up the tracks to accomodate the HSR should be easy enough, but what about freight to places like Ballarat and all the towns they serve? I don't believe it has been attempted anywhere in the world, but there would be no reason not to run a high speed freight service along this route also as per demand, in fact there would be a lot of reasons for. Doing so would be the prelude to one way a national HSR may someday happen. We've seen the cost-benefits don't stack up, but they MIGHT if we could incorporate inter-capital HSR freight as a means to removing a large amount of the truck traffic from our highways, resulting in lower maintenance, fewer accidents, air particulates, etc. Not to mention we'd possess an absolute world beating eastern seabord freight network by way of national competitive advantage. Because doing this initially Sydney-Canberra ought to make sense on a similar basis to the above, and if we've gone as far as Bendigo, building the extra stretch in the middle might make sense down the track. I dunno. To my eye, all of this seems to offer a lot more concrete than any of the nebulous and largely non-public benefits we've yet heard of associated with building a national HSR network. What do readers think? It looks a brilliant rail for the travellers that will save their time and I think they would be happy to enjoy their train journey. This speedy rail will definitely run faster and the travellers who like to travel in it will be able to reach their destinations even they could be able to reach airport timely.